The Teleporter from Mekanism is used in the construction of the multi-block teleporter. It is capable of teleporting a player to another Teleporter in any dimension instantaneously. The Teleporter block will store up to 2,000,000 RF in its internal storage. If the Teleporter is right-clicked it is dismantled and keeps its stored energy. It can accept power from any side. The interface of the Teleporter is shown below. This is a slot to place a portable energy storage device such as an Energy Tablet. This is where the Teleporter frequency is entered. Clicking on each button will increment it by one. This is where the status message is found. See the Operation section for more info. This is where the amount of energy stored in the Teleporter is shown. Hovering over it will display the specific amount. In order to construct a complete multi-block Teleporter, one Teleporter block and nine Teleporter Frames are required. The Teleporter block must be the bottom centre block and a four tall and three wide ring of Teleporter Frames built as in the following screenshot. Right-clicking on the Teleporter block will bring up the interface where the configuration can be done. In order for the Teleporter to work, two Teleporters must be on the same frequency. There are 10,000 possible frequencies that are shared between all players. Once the frequency has been set the inside of the Teleporter will show a field. This means that the Teleporters are link. 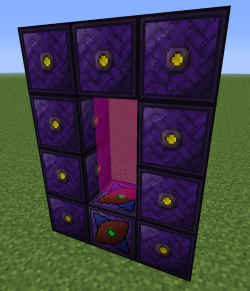 Before teleportation can be achieved, power must be supplied to the Teleporter block. Once the frequency has been set and sufficient power supplied, any entity in the middle of the Teleporter will be instantly transported to the linked Teleporter. If there are any issues with the Teleporter, a status message will be displayed on the interface explaining the problem. These messages and their meaning are listed below. Ready. The Teleporter is ready to teleport entities. No frame. No proper frame has been found. See the Construction section. No link found. Another Teleporter must have the same frequency as this one. Links > 2. More than two Teleporters have the same frequency. Needs energy. Not enough energy is available in the internal storage. Idle. Everything is ready but no entities are inside the frame. Note the energy usage appears to be bugged in version 6.0.4.32. It always appears to use 404 RF despite distance. The proper calculation is shown below. The energy cost of the Teleporter is calculated as (1,000 + (distance x 10)) x numberOfEntities J. 10,000 J should be added if teleporting between dimensions. If the remote teleporter is in a chunk that is not currently loaded, the link will come up just fine and say "idle" , but you wll not be able to teleport. You will need some sort of chunkloader at the destination. You might experience temporary lag right after teleporting. If you try to exit the teleporter right away, you might lag right back in, and consequently jump back! However, the teleporter won't immediately teleport you back if you stand still, so if you wait a few seconds, lag will clear up and you're good to go. This page was last modified on 4 August 2016, at 17:56.